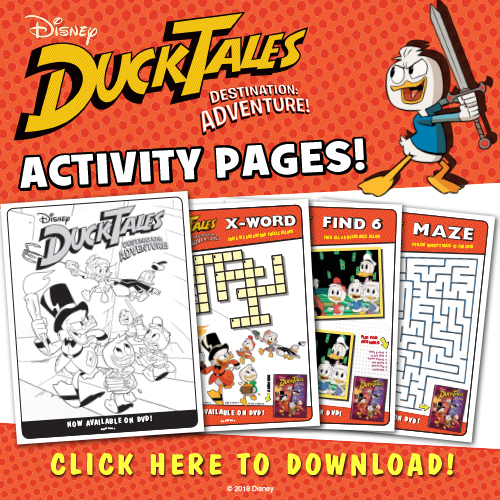 FREE Printables – DUCKTALES: DESTINATION ADVENTURE! You are here: Home / Everything Disney / FREE Printables – DUCKTALES: DESTINATION ADVENTURE! We were provided with a free movie. All opinions are my own. One of the shows I enjoyed most when I was little was DuckTales. I always loved all the fun adventures they would go on and how Huey, Dewey, Louie and Webby always had a positive attitude. It’s one of those shows that bring me back to my childhood and my summers getting out of school wasting time. This summer it’s all about keeping my kids busy with free printables and one of the things that is fun to do is to theme an afternoon of fun around a movie. Recently released is the brand new episode and adventure of Scrooge McDuck and his nephews. Kids have so much to do, but keeping them busy with art projects is easy and fun. The movie starts with an adventure and also ancient tomb in Toth-Ra, the mountain peak of Mt. Neverrest. This is also a vacation island for Greek gods…global expeditions await! Thanks to Huey, Dewey, Louie and Webby, trillionaire Scrooge McDuck is back in action, leading the way to death-defying exploits stretching all the way from Duckburg to legendary destinations around the world. Let the greatest family adventures begin! Keep your little ones busy with games and coloring sheets available below. Remember to reuse the pages by letting kids color and draw on as much surface. My kids always wanted to color some and start new, but we make them color and create more with less space. Uses less resources. Get your own Duck Tales Destination Adventure! free printables now. Your family can start an adventure today by getting your own copy for your own fun adventures. Learn more about Duck Tales. The Spear of Selene! The Missing Links of Moorshire!